Data for the UK showed that 76 per cent of customers prefer dealing with human beings to digital channels to solve customer-services issues. I recently tried to hire a holiday property to accommodate a large family group. I needed to be sure it had certain facilities but the rental company’s website didn’t allow me to drill down into the detail. I tried phoning and was routed to an international call centre where the person I spoke to couldn’t help. I was then given an “Irish” contact number but this turned out to be the same one that had connected me to the call centre in the first place. Had someone been giving out awards for frustration, I was gold-star material by the end of the experience. The digital natives eavesdropping on my conversation found the notion of expecting to speak to a human highly amusing. “Wouldn’t you want to speak to a real person to get your problem solved?” I demanded. “God no,” they chorused, burrowing deeper into their smartphones. Maybe not now, I thought, but age and life experience may change that. Feeling like a fossil with calcified notions about what constitutes customer service, I turned for enlightenment to the 2016 Accenture report Digital Disconnect in Customer Engagement. It seems I’m not alone in craving cogent human contact to resolve specific issues. In fact, an overwhelming majority of the almost 25,000 people in 33 countries who participated in the research underpinning the report wanted a human to solve their problems and were willing to pay more to get it – which rather flies in the face of those who see “human” customer service as old hat and an expense they don’t need. Data for the UK showed that 76 per cent of customers prefer dealing with human beings to digital channels to solve customer-services issues. More than 50 per cent have switched providers due to poor customer service and 47 per cent were willing to pay a higher price for goods and services if it ensured a better level of service. Robert Wollan is senior managing director for advanced customer strategy at Accenture strategy in the United States and the holder of seven patents for customer relationship management innovation. “Companies have lost sight of the importance of human interaction and often make it too difficult for consumers to get the right level of help and service that they need,” he says. The Accenture report says that there is still significant room for improvement in the delivery of customer services and that companies abandon the human connection at their peril. Those that have done so need to rebuild it in order to deliver the varied outcomes today’s customers want and expect from a buying experience. One young Irish company that has spotted an opportunity to fill this human void is Wexford-based Voinext, which allows customers talk directly to a business from the business’s own web page. Voinext chief executive and co-founder Jim Tracey got the idea for the service from watching his children using free voice apps and set about developing a “talk” service for businesses that would allow consumers get their queries answered quickly and make it more likely they would complete a purchase. “We do for business what WhatsApp has done for consumers and are bringing back the personal touch that the internet took away,” Tracey says. Accenture recommends putting the human and physical elements back into customer service by focusing on “delivering satisfying customer experiences – not methods of interaction”. Secondly, it advises making it easy for customers to switch channels to get the experiences they want in a particular situation. Defining, addressing and eliminating toxic customer experiences comes next, followed by guaranteeing personal data security and not selling or sharing customer information with anyone else. “The digital-physical blur is changing the entire front office and customer agenda – are you really future-ready?” Wollan asks. Leslee O’Loughlin, human resources manager at Enterprise Rent-a-Car Ireland, says that while technology plays a crucial role in streamlining the customer service function for many companies, the digital solution can never fully take the place of the human touch. 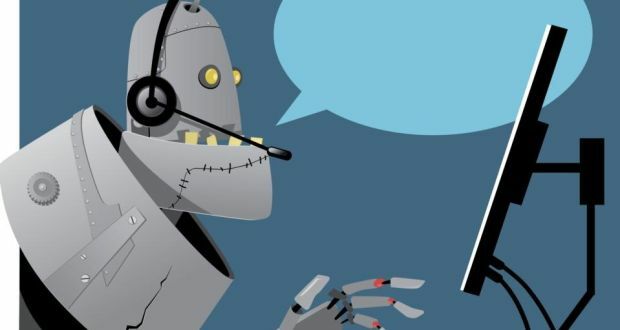 “Automated telephone response systems and online tools can take you so far, but there is no getting away from the fact that customers like to deal with a real person they can trust to know what they are talking about,” she says. “We believe that even though there are extremely efficient agent support systems available, live agents should always be accessible. Customer service needs to be easy, convenient and fast. Trawling FAQs, having painstakingly slow web chats or being queued to interact with a disembodied voice simply don’t hack it. Losing customers is an expensive exercise and Accenture’s research shows that once a company loses a customer, 65 per cent of people will never go back.